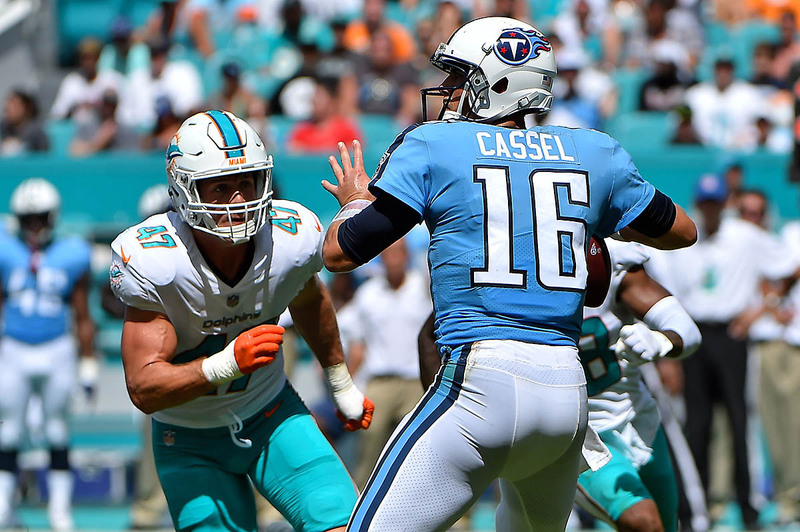 Nashville, TN – In Week 5 of the 2017 season the Tennessee Titans went on the road to face the Miami Dolphins and were defeated by a score of 16-10. With QB Marcus Mariota battling a hamstring injury, QB Matt Cassel made his first start of the season. Cassel was 21-of-32 passing for 141 yards and one touchdown. In the first quarter, RB DeMarco Murray fumbled the ball on second-and-13 to give possession back to Miami at the Tennessee 42-yard line. After a third down pass break up by CB Adoree’ Jackson on what would have been a Dolphins touchdown, Miami was forced to settle for a 41-yard field goal by K Cody Parkey to get on the board first, 3-0. On the following drive Cassel completed a 59-yard touchdown pass to TE Delanie Walker, however the score was nullified due to an offensive pass interference call on TE Jonnu Smith. Two snaps later, Cassel was sacked by Dolphins LB Kiko Alonso and fumbled the ball. Dolphins S Reshad Jones scooped up the ball and returned it for a 38-yard touchdown and put Miami ahead 10-0 late in the first quarter. In the second quarter, Jackson forced Dolphins RB Jay Ajayi to fumble the ball. It was recovered by S Kevin Byard to set up a 45-yard field goal by K Ryan Succop and put Tennessee on the board, 10-3. The third stanza saw WR Rishard Matthews make a 17-yard, third down catch to keep the chains moving. WR Eric Decker caught two back-to-back seven-yard passes, followed by a nine-yard rush by Murray. TE Phillip Supernaw registered his first career touchdown, an 11-yard reception, and Succop converted the extra point attempt as the Titans tied the game 10-10. In the fourth quarter, Dolphins WR Jarvis Landry tacked on a six-yard touchdown but the extra point attempt failed. Tennessee couldn’t manufacture a comeback and eventually fell to the Dolphins by a final score of 16-10.